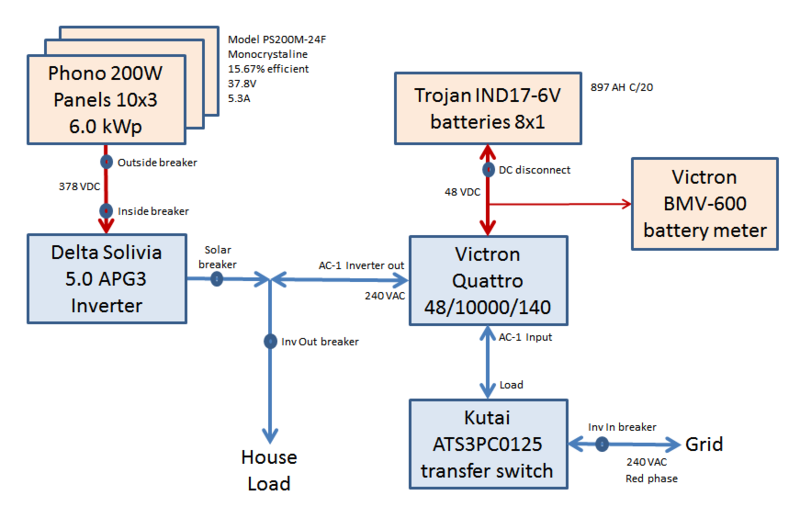 I have an existing solar hybrid grid-tie / off-grid system, built around a Victron Quattro. It's been working great, and I'm generally very happy with the hardware, but their technical documentation is pretty weak. I've been trying to make a few adjustments to the configuration settings over the last few weeks, and it's not going smoothly. Unfortunately, Victron tech support hasn't been much help so far. Is anyone here familiar with the Victron inverter/chargers, beyond what's explained in the manuals (which I've been through about a million times)? In VEConfigure, in the gauges on the left, when solar power is off, I'm pretty sure IMains shows amps from the grid, and IOut shows amps to the load. In my setup, the solar inverter is connected to the output of the Victron. When it can't accept power input because the grid is down and the batteries are full, then it shifts the frequency of the AC by 1 Hz, and the solar inverter turns off. That all works great. The first question I have is this: when power is being back-fed from the panels to the grid, what do IMains and IOut show? I expected it to be net current, but it's not; both numbers go up when the load increases, while exported power, read with a separate external meter, goes down. Many more questions beyond this, but that's a start. I'm also trying to get their new Hub-2 assistant to work. Quite an ordeal. Welcome to the forum... I don't have any insight to your issues, but I do have a question. How are you measuring the output power to the grid? Are you using a true power meter that can determine the direction, as well as amount, of power being exported? Many meters cannot determine the direction of AC power flow. I'm using a Cent-o-Meter. It doesn't tell me direction directly, but I can tell when power is being exported because the number goes down when I increase the load. I can also confirm direction by looking at the power company's kWh meter, which has both a directional indicator and separate measurements for outgoing vs. incoming (I'm billed at one rate for incoming, and they pay me at a different rate for outgoing). The Quattro only has three power connections: mains, load, and batteries (the second AC input and output are currently unused), and the output of the solar inverter is connected on the load side, before it reaches the Quattro. I am guessing you intended VA and not kVA in your numbers above. Hah! Yes, of course. Fixed. I have a Multi, which works very similar to your Quatro. I struggle to understand your configuration. The Quatro measures only your AC source(your grid) Volt and Current, the AC dellivered from the inverter and the DC current and volt to and from your batteries. If you feed AC from the panels to the AC output on the Quatro nothing will show up on your VEConfigure screen, to be honest I didn't think you could do that. I assume you have a switch witch disconnect the Ac from the inverter when your panel dellivers power? What do you mean by Load on and off? 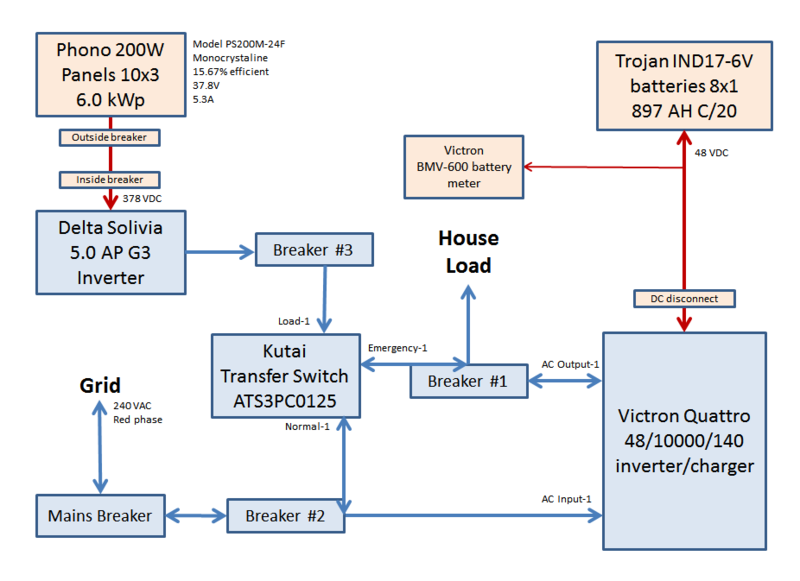 I've attached a diagram from Victron that's similar to my configuration. In my test setup, at the AC source (grid), the current flow was back toward the grid (export). If the Quattro was reporting net current, then the value should decrease when I add load. It should also be much higher! If you feed AC from the panels to the AC output on the Quatro nothing will show up on your VEConfigure screen, to be honest I didn't think you could do that. I assume you have a switch witch disconnect the Ac from the inverter when your panel dellivers power? Is there an AC disconnect on the solar inverter? Yes, of course. I never need to trigger it by hand, though. If there's excess current from the panels (above house load), and the batteries are fully charged and the grid is offline (power outage), then the Quattro will increase the AC output frequency by about 1 Hz, which causes the PV inverter to turn off. Is your intention to feed back PV enegy to the Grid? Yes -- that part is in-place and working fine. The AC from the PV inverter flows back into the Quattro through AC Out, and can be used to charge the batteries that way. If the batteries don't need charging, or if there's excess current available, then the difference gets exported to the grid. The second AC input is designed to be used with a generator, not a PV setup. Unknown territory for an off grid guy - thank you for the information. I am just surprised that the Victron can help you - are you addressing the right guys in the Netherlands? May not be the "right" guys, but I've been working with their "service" and "support" folks (or trying to; they've stopped answering my emails). Just thinking out loud here, but I'm wondering now if what I'm seeing might be a change in power factor. I can't think of another explanation for what I'm seeing. Will have to test. Looking at your numbers, it appears that GT inverter is connected to the "Mains" side rather than "Out" side. Hmm. Good point, it does look that way -- with IMains higher than IOut while current is flowing out to the grid. However, that's not the way it's wired. Easy to double-check by simply turning off the mains breaker during the day, while the batteries are being charged from the panels. IMains drops to zero, while IOut stays high, and the batteries continue to charge. If the GT inverter was on the Out side then the energy would flow from Out to Victron and also would be much larger (ca 2kW), and it would decrease with increasing loads. Also the energy would flow from Victron to Mains, also would be large, and also would decrease with increasing loads. So, apparently, this is not the case neither. We just don't see 2kW of solar traveling through Victron. Perhaps you have some completey different wiring. Have you tried to follow the wires and draw a diagram? If the GT inverter was on the Out side then the energy would flow from Out to Victron and also would be much larger (ca 2kW), and it would decrease with increasing loads. Also the energy would flow from Victron to Mains, also would be large, and also would decrease with increasing loads. So, apparently, this is not the case neither. We just don't see 2kW of solar traveling through Victron. Yes, that makes sense -- all part of my confusion, and why I started this thread. One thing I do see is that the panels can charge the batteries through the Victron, even when the grid is disconnected. I also see that the Victron can increase the AC frequency on the house side, and the Solivia will detect that and shutdown. Perhaps you have some completey different wiring. Have you tried to follow the wires and draw a diagram? I haven't tried to re-trace the installer's work, but I guess I should. I know how it's meant to be wired (see attached diagram), but I don't know for sure how he actually did it. One area where I'm confused is exactly how he wired the automatic transfer switch. It has an "emergency" side, which seems to be wired, but I don't understand how or why. Haha! You have same batteries as I do. You're the first guy with the same batteries here. How do they work for you? What charging settings do you use? Have you measured the SG yet? It may be worth doing. Because I can't imagine that it could be so far off from real numbers with its measurements. Something is not right. Float starts at 55.20V for the first 24 hrs, then drops to 52.80V in "storage" mode. The batteries could take, and the charger could deliver, a C/10 charge current, which would be 90A. I have it set back a little from that, at 80A. I've tried to get some details out of Trojan that would help me optimize the charger settings, but so far no luck. Haven't measured SG yet, but it's on my list of things to do (I need to get a hydrometer first!). I topped-up the cells with water once, but they didn't really need it. The system is only about four months old. How about you? What charger settings are you using? Yes, I agree. Unfortunately, a number of the wires involved on the AC side are hidden behind a wall, but I'll see what I can find. I'll do some additional load testing, too. It actually wouldn't surprise me if the problem was a Victron firmware bug. I upgraded the firmware a few weeks ago, and it's been quirky ever since. I'm thinking of going back to the previous version. I heard back from Victron support again this morning. Once again, absolutely no help. Very disappointing. I am off-grid, so I need daily cycling and fast charging. Unfortunately, I found that these batteries are very hard to charge. They require very long absorptions. 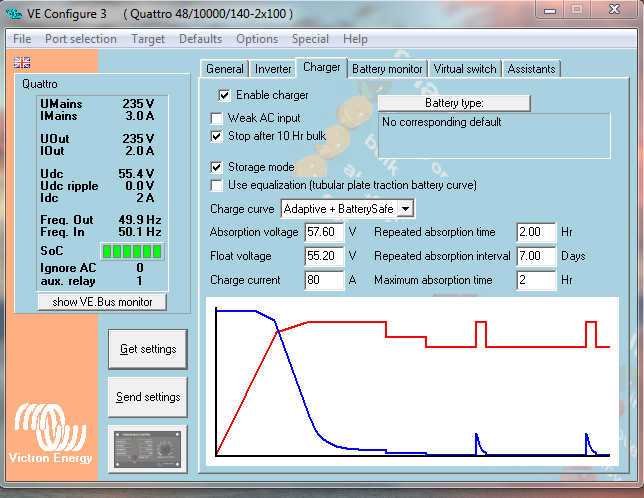 I was able to make absorptions reasonably short (5-7 hours) by increasing the absorption voltage all the way to 64V. There were no other way to keep SG high. They sort of work this way, but I'm afraid high voltage may affect them in a bad way. They do not really work for off-grid applications, especially in the North. Other than that everything's well. There's no problem with deep (up to 80% DoD) discharges, low internal resistance, no overheating. I think they are more suitable for applications like yours, because long charging is not a big deal for you. If you keep them on float with occasional deep discharges followed by long charging periods they will work great for you. I think that this is what they were designed for and should excell at. I would suggest measuring SG as soon as possible, just to make sure it stays up. At least they should be able what do the numbers mean and what is the direction (e.g. + to Victron, - out of it). If you go back in firmware and look at the numbers again then it will be a good test to see if Victron is crazy or something is miswired. I often get a fair amount of gas generation at the end of absorption, so I'm pretty sure the electrolyte is well mixed. The Victron's model for equalization isn't quite the same as Trojan's, though -- not sure yet if it would work without harming them. Yeah, you would think. No such luck. The DC side is easy to check; everything looks fine there. It's the AC side that's a bit hidden. I should be able to do some testing just based on flipping the various breakers and observing the readings. Another possibility is that my Cent-o-Meter's inductive watt meter isn't very accurate. That and varying power factors might explain what I'm seeing. Yes. I cannot go past 64V with my inverter anyway. About 6 hours usually bring SG up. Without heavy cycling, 4 hours give decent SG reading. I often get a fair amount of gas generation at the end of absorption, so I'm pretty sure the electrolyte is well mixed. I've only seen few bubbles here and there at 59V. They do bubble well at 64V. I would rule out inaccuracy. Even with worst inaccuracy imaginable, you cannot miss 2kW. About 6 hours usually bring SG up. Without heavy cycling, 4 hours give decent SG reading. How much current does your system deliver to the batteries during bulk? Something near C20/10? That would be about 70A for the IND13-6V. Mine bubble well just a little under 58V. Equalization is 62V, so I'd hope they bubble well at 64V! Victron's approach to equalization is incorporate it into the standard charging curve. What they do is when the charge current has dropped to 10% of bulk, they hold it at 10% and allow voltage to rise until it either reaches 68V or absorption completes. They call this the "tubular plate traction battery curve." They also have a forced equalization mode from the main control panel, but as far as I can tell, it does the same thing. If you don't select that charging curve (which I don't), then they apparently rely on regular / repeated absorption to ensure the electrolyte is mixed. You're probably right, although I can imagine a lot of inaccuracy! Esp. since the 2 kW number is coming from the cheap-o inductive meter. An additional complication is that the house has three-phase power, and this system is only attached to a single phase. I use the other two phases as a type of load shedding in the event of a mains outage. With solar it can go up to 100A (14% of C20). I used to do 100A with generator too, but then I decided that it'll be easier for all the equipment if I switch to 80A. I'm thinking about going to 70A with generator, but I haven't decided yet. Victron's approach to equalization is incorporate it into the standard charging curve. What they do is when the charge current has dropped to 10% of bulk, they hold it at 10% and allow voltage to rise until it either reaches 68V or absorption completes. They call this the "tubular plate traction battery curve." Forklift battery chargers normally do that. Off-grid chargers try to mix the bubbling with absorption by increasing absorption voltage a little or do frequent equalizations. This may not be a bad idea, but I think they mostly do that for historical reasons. Batteries in off-grid applications used to have lots of DC loads and controllers couldn't figure out how much current went to batteries and how much went to loads. They're only starting to catch up with that now. If it charges batteries when your grid is off, they're definitely all on the same phase. I'm still testing, but found a few things. 1. I measured the current in and out of the Victron, using the clamp-on meter, and the numbers are close to what the Victron itself is reporting. 2. I measured the current out of the Solivia using the clamp-on, and the numbers are close to what the Solivia reports. With nearly 5 kW out of the Solivia, there was only about 0.75 kVA at the Victron. The house load is nowhere close to the difference. Seems more and more like a wiring problem, just haven't nailed it down yet. My main panel is a mess; I hate digging around in there with the power on. Thought so yesterday, then confirmed today after turning the power off and tracing the wiring. I'm actually surprised the system works as well as it does. I'm glad you found it. If the GT inverter doesn't shut down when the grid is off, it shouldn't make much difference. It works fine in "normal" day-to-day mode, whether on grid or off. The problem is that I want to switch to a self-consumption mode, where the inverter/charger ignores mains at night or while the battery has enough charge to supply the house -- only then do I want it to connect to the grid, to either power the house or possibly charge the batteries if their SOC is low enough. 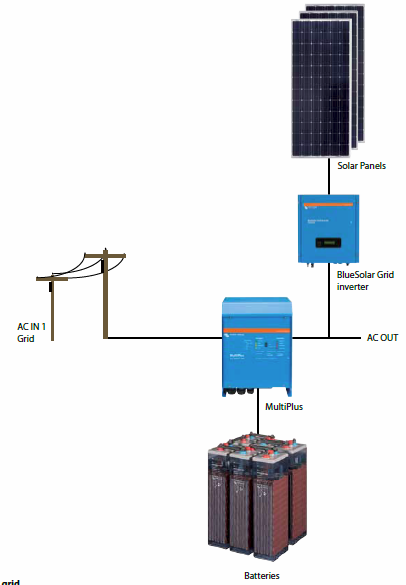 In a setup like that, the inverter/charger doesn't know that the panels are on when they're connected to AC-out, because the current is flowing directly to the grid, and not through the unit. The GT inverter must have some means to dial down the production if batteries are full, loads are low, and grid is disconnected, because in this situation there's no place the energy would go. Do you know how does it handle this? Is it networked with the inverter/charger? The way it works is that the inverter/charger increases its output frequency by 1 Hz (exact amount is configurable). The solar inverter detects that change, and shuts down. Some solar inverters can vary output in proportion to the frequency change. The Solivia can't; it's either on or off. It's this aspect of things that made me surprised to find the solar inverter on the grid side of the inverter/charger -- since the frequency-change-shut-off feature is working. Very puzzling. Perhaps it changes frequency on Mains too? But if it does, how does it know that the grid is not there? I decided I should make a diagram for this, since it's confusing enough that it's easy to forget the details. Copy attached. Doing that also resolved my confusion: the solar inverter is actually switched from AC-in to AC-out on the inverter/charger by the ATS, when the grid fails. During normal operation, the grid is connected to both the inverter/charger's AC-input, and to the automatic transfer switch. The ATS connects it to the solar inverter (in the diagram, the ATS works by switching "Load-1" between "Normal-1" and "Emergency-1", depending on whether it senses power at Normal-1 or not). As long as the grid is there, any extra power from the panels has a place to go, so the disconnect feature isn't needed. When the mains go away, the ATS disconnects the the solar inverter from the grid, and connects it to the house load and the AC-output port of the inverter/charger. 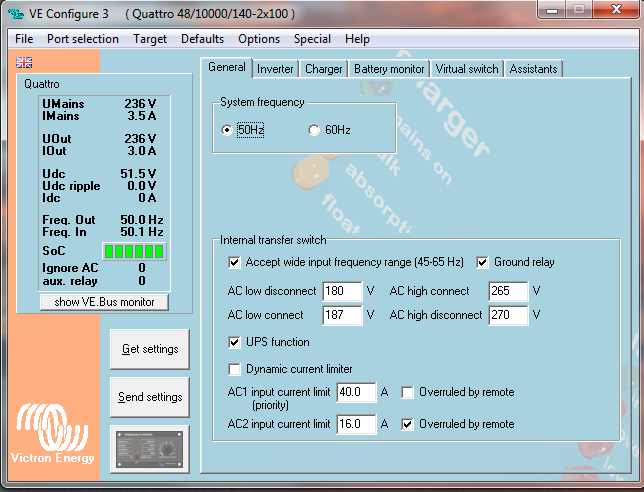 Since it's on AC-out at that stage, it can respond to frequency changes. The way it *should* work is that the solar inverter should be on AC-out all the time, and the ATS should just disconnect the grid from AC-in when needed. I do wonder about where the ATS gets the power for its relays in a case like that, but it must be a common configuration for use with generators.